Over 500 policemen and 220 soldiers took part at the border crossing of Spielfeld, according to an AFP correspondent at the scene. 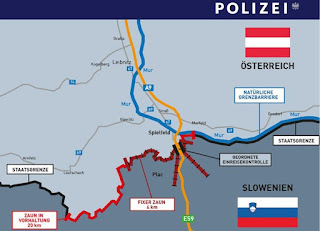 "A state which can't protect its borders when needed loses its credibility," said Interior Minister Herbert Kickl, who oversaw the exercise along with Defence Minister Mario Kunasek. Both men are members of the far-right Freedom Party (FPOe), which since last year has been the junior partner in a coalition government under conservative Chancellor Sebastian Kurz which has been at pains to emphasise its anti-immigration message. Among the military hardware on display today were two Black Hawk helicopters.